We’re excited to announce our first annual Holiday Giveaway! You can enter to win this gorgeous pair of 8″ Gingher Designer “Sarah” Series Dressmaker’s Shears in a gift tin with sheath, PLUS a length of pattern paper. The “Sarah” series has been retired and currently retails for up to $99.99, and the value of these collectibles tend to rise as they become more scarce. Use them as a special gift for the holiday’s, or keep them as a gift for yourself. Better yet – USE them to make gifts for other people. To enter, simply reply to this post with a comment about your favorite fall or holiday project, or submit a link to a favorite fall themed project tutorial. You can also get a second entry if you post a link on your blog or website to this giveaway page, or add us to your blogroll. Just email us at submit@sewingbusiness.com to let us know that you qualify for a second entry. Enter by Saturday, November 28th and we’ll announce the winner on Monday, November 30th. Good luck and enjoy all of your holiday creating! I am sewing jersy scarves to be given as gifts. I also want to work on a fabric advent calendar. after looking at all the beautiful fall colors in nature, i get myself ready for xmas knitting. i love knitting toys to give to all the kids i adore .. and they seem to enjoy receiving them a whole lot more than they ever did when i made scarves or sweaters or whatever. i love anticipating the glow in their eyes upon getting a cuddle-toy i have handmade! I am excited about my new project. I will be attempting to make my first winter coat. I collected the supplies and a lovely heather brown wool fabric. Wish me well. I would love to have the new scissors. I would love to make an adorable Fall dress for my daughter I found online. The tutorial looks easy enough to follow and it won in the first round of contests over at So You Think You’re Crafty (http://soyouthinkyourecrafty.blogspot.com/). I love making fall pillows and table runners. You’re site is GREAT! I love making Christmas aprons, PJ Pants and pillowcases. I also made a sassy fall tote bag this year. Thank you for sharing your site. I like it! My favorite thing right now to make is leaf garlands, just by cutting out shapes of leaves from fabric and sewing them all together onto a length of rickrack or ribbon, and then hanging them over doorways, its very cute, and adding a few acorns onto the garland with super glue really adds a nice touch. there’s no need to finish the edges becuase the fraying really gives it a folk artsy look and its a quick project that only takes me 30 minutes to do! My favorite thing is making clothing for my children and teaching others how to do the same. So far the most useful piece I’ve made is a petticoat for my daugther. We use it under everything. Friends were interested in making it so I made a tute for it @ http://www.squigglytwigs.blogspot.com It’s in the tutorials section. I have fabric all picked out to make a fall table runner. I am so excited to create it! I am thinking of painting a MALMA mirror from IKEA — that has been a success in the past. Another favorite holiday project is to crochet necklaces from beads. I can’t give you ONE favorite! I love sewing just about everything! I made a really cute door wreath one year! It involved tons of sewing as it had a plush figure on it! My current project is a project with the kids — we’re making a garland out of old Holiday cards. Just using different sizes of circle punches to cut the cards and sticking them onto a long piece of string using sticky dots from the office supply store. My favorite holiday crafting/sewing activity is making wreaths of any kind with the kids! I am learning how to make quilts, I would like to make one for each of my girls for when they are older! I am teaching a paperpieced tree block this year. We are having a block swap with these trees. Last year we did Christmas cottages! Anything Christmas is wonderful and cheery to sew with. I am finishing up our Christmas stockings!! With 5 kids, it is a lot of work!!! I love making fabric covered button magnets…this year my daughter and I are making a pair for everyone we know! My favorite holiday craft is making Christmas stockings. Last year, each family member made a stocking reflective of their favorite craft. Mine was crocheted with a fun holiday fabric lining, my daughters was a funky quilted stocking, my husband sewed a stocking out of soft leather and fur… we’ll be doing this again! I mean fabric pumpkins! How cool is that? For holiday crafting, I love pine cone crafts and felt crafts. Although I always seem to find cuter ideas on the web than I can actually create myself! This year I am hand making most gifts. My main source is old jeans. I make aprons, pot holders, bags and purses. I am making a wallet too. my favourite project will be the crochet, table runner i am currently working on! I have been making scarves from sweaters I will no longer wear. It’s been fun trying different pattersn and with different types of sweaters! When I was a little girl, I could hardly wait for the fall !!!! Not for the reason you may think, school, but because I love fall colors, the cool crispness in the air, rainny season, and a time to think of the holidays. What more could you ask for. Then the fun came, baking cookies and tamales. It may not sound like they go hand in hand, but they do. As many of my friends were thinking of turkey with all the stuffing, I was thinking: tamales, buñuelos, atole, menudo…and all the great Mexican traditions. Most of my family did counted cross stitch, but I loved to sew and embroider. I cannot say we were dirt poor, but we were definitely not rich or even middle income, but we were rich in family and customs. My mother and her neice, the only ones living in California would get together and my cousins, brothers and I would play games, take walks, and make tamales and menudo first. When all that was cooking, we would make buñuelos. The dough was similar to flour tortillas, but you would stretch them out as big as you could and let them dry on cheese cloth. When they were dry to the touch, you would fry them up and then coat them with sugar and cinamon or with a syrup made with piloncillo and water, a type of hard brown sugar in the shape of a cone. Then we would make a hot cornmeal drink, atole or champurrado, and have that with buñuelos while we waited for the tamales and menudo to get done. My cousin and I would get out patterns and cut out clothes to sew. I used to make blouses out of muslin and then hand embroider them. Now, some 40+ years later, I use an embroidery machine and I still sew. I still make tamales, and I love menudo. Though most of my family lives far away now, I still have my memories that I will always cherish. I still love fall, apples, cool weather, and the colors. I am able to be creative again, and now that my children are grown and away from home, I am planning my own sewing business. I have always wanted an embroidery and sewing business, and thanks to the encouragement in this website, I am going to realize my dream. I hope many of you have great memories. How I love to hear different customs and the memories everyone has to share. although, i do plan on modifying the design and color scheme slightly to fit in with our other decorations. I sew everyday and I would Love, LOVE a pair of these amazing scissors! Anyhow my favorite holiday sewing project would have to be the “Advent Calendar in the hoop embroidery design” you can see it here. https://inthehoopdesigns.secureserverdot.com/x-cart/product.php?productid=16426. I will be making several for friends and family .. It is SEW much fun!! This year, I have started to learn embroidery. I love adding a personal touch to tea towels, hoodies, napkins, and jackets. I love picking the colors, hooping up the material, and stitching away. This year, I am going to make several calendar tea towels, hand stitched with the recipients last name. Hi everyone! My favorite holiday is not just one, but any day I can make something to give as a gift to someone I care about. I do all sorts of crafts: quilting, hair bows, clothing construction, pet gifts, dolls, doll clothes, stuffed animals, home decor, alterations, restyling resale clothing, and just having a blast doing all this. 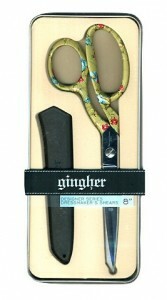 I’d really enjoy winning a great pair of scissors to use in my gifting pursuits! I’ll be making aprons for my friends and for the church thrift sale. I’ve been collecting fabulous vintage fabrics from Etsy and eBay, as well as new fabrics that made me go weak in the knees from wanting so badly to make something up in them. The sky’s the limit as far as creativity and utility (trim, ruffles, extra pockets, burst of color) and I just love that they always stay in style. I especially like doing themed aprons – cats, bunny rabbits, Paris, chickens and eggs, whatever the recipient’s special love is. I treasure the ones my Mom made for me, and hope that my efforts to contribute to holiday giving and sharing will result in smiles, hug, and special treasures for lots of others as well. Oooh! I just love making gifts for Christmas! My favourite one was when I was a teenager, and my mum collected clowns. I made her the most divine stuffed clown, which she still has. I was so proud. Thanks for the lovely giveaway! What a fantastic giveaway! The best scissors on the market. My favorite thing to do this holiday season is sewing placemats and napkins for my mother for a Christmas present and a fleece hat for my great-granddaughter. Those scissors are wonderful! What a gift that would be! I will be making silk scarves, iipod carriers, and some lounging pajamas for my four granddaughters and my daughter in law. I will also be helping my daughter sew a velour top for her daughter. What could be better than that time together. I am really looking forward to that. Thank you for the opportunity to win those beautiful scissors. 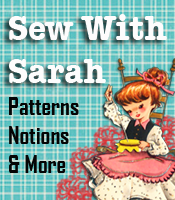 I am having a sewing marathon – only 76 days until I leave for my honeymoon in Italy for 7 weeks. So much to make, including a flowergirl dress for my 4yo grand daughter to wear at my wedding. Life is so exciting for me and I can’t wait!